If baby teeth are just going to fall out, how crucial is home care? Is there really a need for fillings? What about a crown? In Charlotte and across the country, many questions are asked by parents about the importance of children’s baby teeth. Trust a pediatric dentist regarding the truth about these and many other questions concerning baby teeth and how important they are to your child’s long term dental health. As soon as baby teeth start to erupt, their value becomes evident. Usually, around six months of age, a baby’s lower front teeth erupt and as baby continues to grow, more teeth will come in until there are twenty teeth in total. Also known as primary teeth, these teeth are very important. Children need these teeth to be healthy and strong to chew food efficiently. This is a reason for great and continual home care. Brushing and flossing twice daily is essential to maintain great hygiene for healthy gums and teeth. Children need an adult for assistance with daily homecare as they become familiar with proper brushing and flossing techniques. Primary teeth help children to form words and permit children to speak clearly. When speaking, the tongue presses against the back of the teeth to form sounds. Tooth decay and poor homecare can cause these teeth to die, become prematurely loose, or need to be extracted. Without these teeth, simply learning how to form sounds and speak normally can create unnecessary barriers for a small child. If decay has been detected and diagnosed by your dentist, a filling or crown can be recommended. These teeth are important to save because they serve as space holders for the permanent teeth that are forming under the gums. Primary teeth guide and form a path for permanent teeth to preside. A primary tooth should not be removed until the permanent tooth is ready to move into its place. Understanding the importance of primary teeth can help a child enjoy a healthy mouth during childhood and adult life. 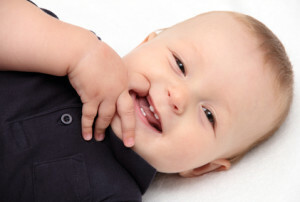 Please contact a pediatric dentist today to learn more about how to preserve and maintain healthy baby teeth. 2 Responses to "Let’s Squelch these Dental Myths about Baby Teeth"
My son had two caps in and they came out can you fill them instead of putting caps back on? Please call our office and we can discuss.